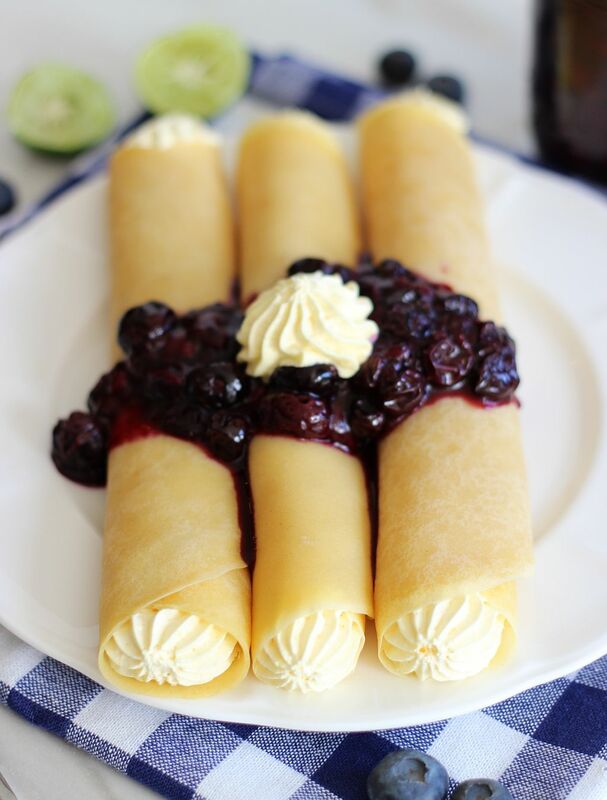 These crepes are filled with a super easy-to-make key lime custard, and topped with a fresh blueberry sauce! 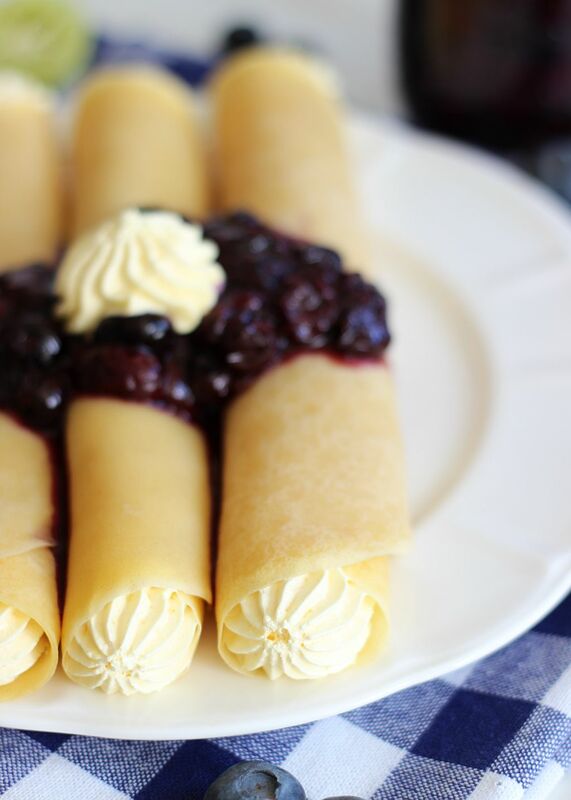 They boast delicious seasonal flavors, and make for a great weekend breakfast or dessert! It’s almost over. 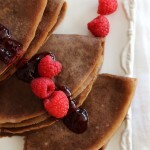 If you’re tired of seeing crepes this week (that’s not possible, hopefully? ), it’s almost over. 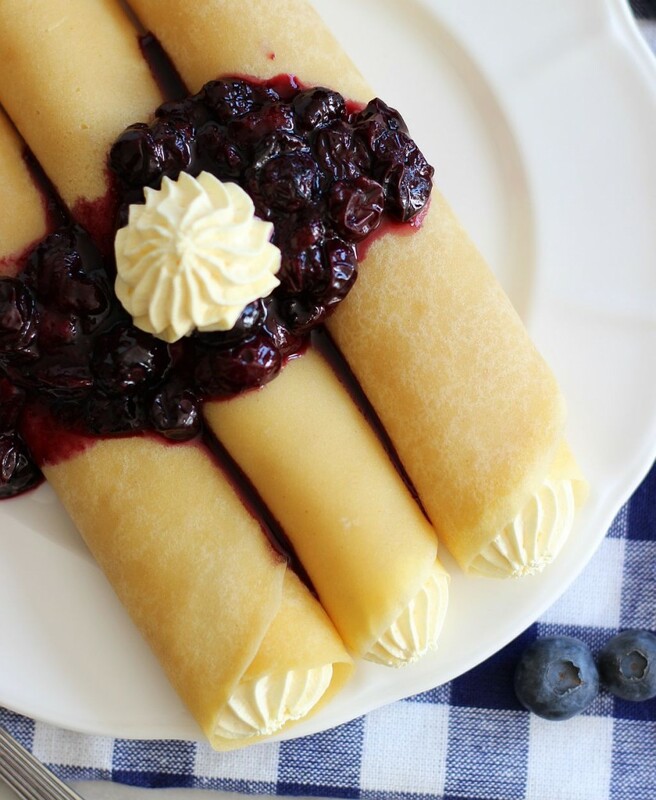 We’re in the homestretch of crepe week. Crepe week actually turned into like 2 weeks of crepe recipes because I got behind on LIFE. Life in general. So behind. As in, I *still* have Christmas stuff to put away. I wish I were kidding! That is one example of my behindedness (yep, not a word). But I got delayed in some of the posts. Whoops. Enough about how behind I am (it’s baaaad), and onto crepes. Although, it occurs to me, maybe I’m behind because I made about 150 crepes in the last few weeks. I wish I were kidding about that too, but I am most assuredly NOT. Sooo many crepes, but it was a delicious couple of weeks! Between the other crepe recipes I’ve shared so far, and the big fat failure, I’ve had crepes coming out my ears. I attempted the failure again this past weekend, and it was a second big fat failure. I’m talking about a crepe cake. I made 32 crepes TWICE for a crepe cake I wanted to share, and the cakes both FAILED. So, my stance on crepe cakes is now as follows: never again. Happier things. Let’s talk about a success story – these Crepes with Key Lime Custard and Blueberry Sauce! These were the product of S.O. bringing home a bag of about 30 key limes because he thought they were ‘cute’. Yes, that was the word he used. I love blueberries with lemon, and think of those two together as a power team. Key lime? Same deal. 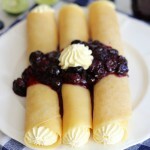 The blueberry sauce is simple ingredients as well. Fresh blueberries mixed with a little sugar and more fresh key lime juice and zest! The blueberries burst and explode as they cook, and become intensely sweet, flavorful, and colorful! This is such an easy way to make a fruit sauce and it doesn’t disappoint. It’s vibrant and pretty, and it tastes incredible! 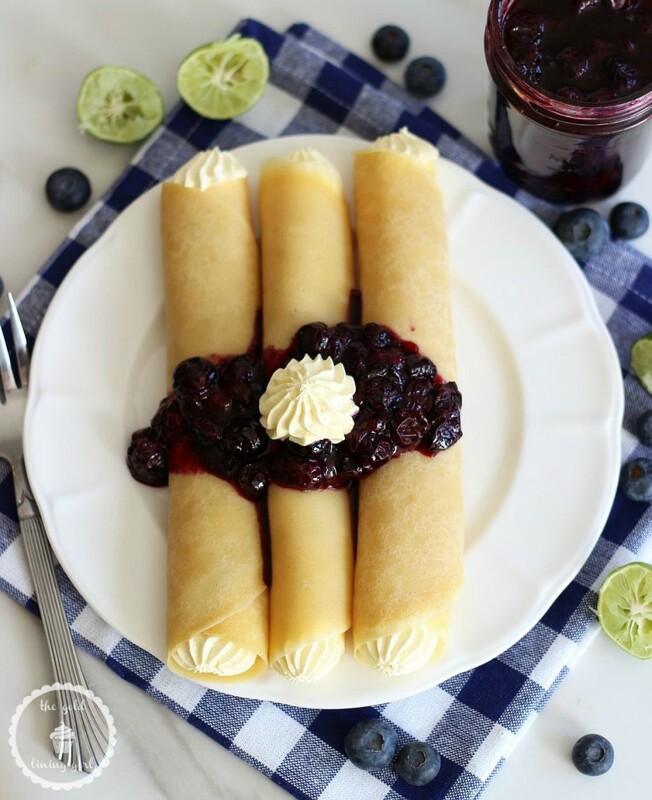 These crepes are filled with a super easy-to-make key lime custard, and topped with a fresh blueberry sauce! In a medium pot, combine all ingredients and cook on medium-high heat, bringing it to a boil. Reduce heat to low, and simmer for 10-12 minutes. Remove from heat, and allow to cool. It will thicken slightly as it cools. In a large saucepan over medium heat, pour about 1/3-1/2 c. batter, covering the entire bottom of the pan in a thin layer. In a large bowl, combine vanilla pudding mix and milk. Whisk until smooth. Fold in whipped topping, key lime juice, and key lime zest. 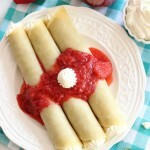 To serve, spoon or pipe the filling evenly across the diameter of the crepes, and roll them into 1-2 inch tubes. Spoon about 3 tablespoons of blueberry sauce over top. Enjoy! 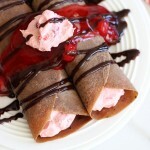 I have been dying to make crepes so I think with crepe week and all these amazing recipes, I am set! 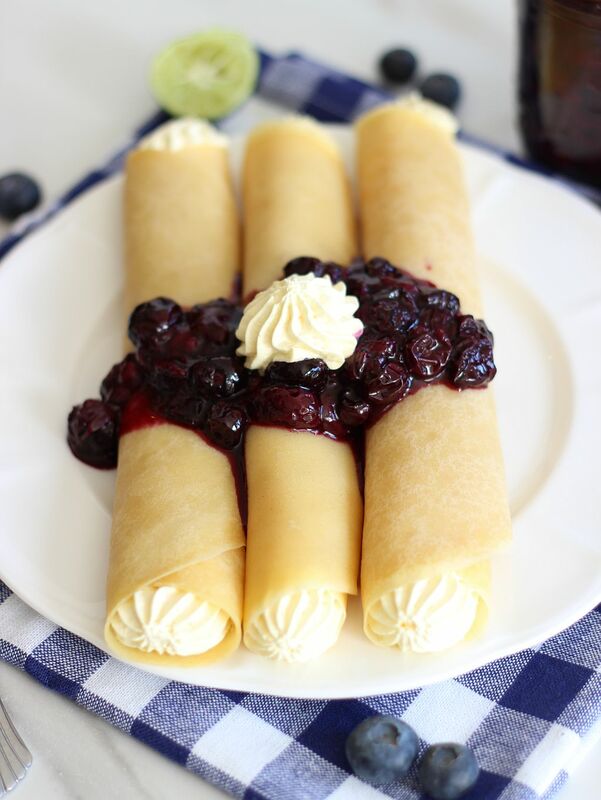 These crepes look absolutely delicious! And that filling? I could eat with a spoon! I love all things blueberry and all things lime (or lemon). These look delicious! Oh yum, these look so amazingly delicious! Thanks so much for linking these up to the Creativity Unleashed link party; I’m definitely going to try them. I just wanted to let you know that these were my pick for Rockstar of the week at the party! Voting is open now to chose the MEGA Rockstar of the week, so stop by and cast your vote, and tell your friends to vote for you too! I really hope you win this week; good luck! I love blueberries and lime together! 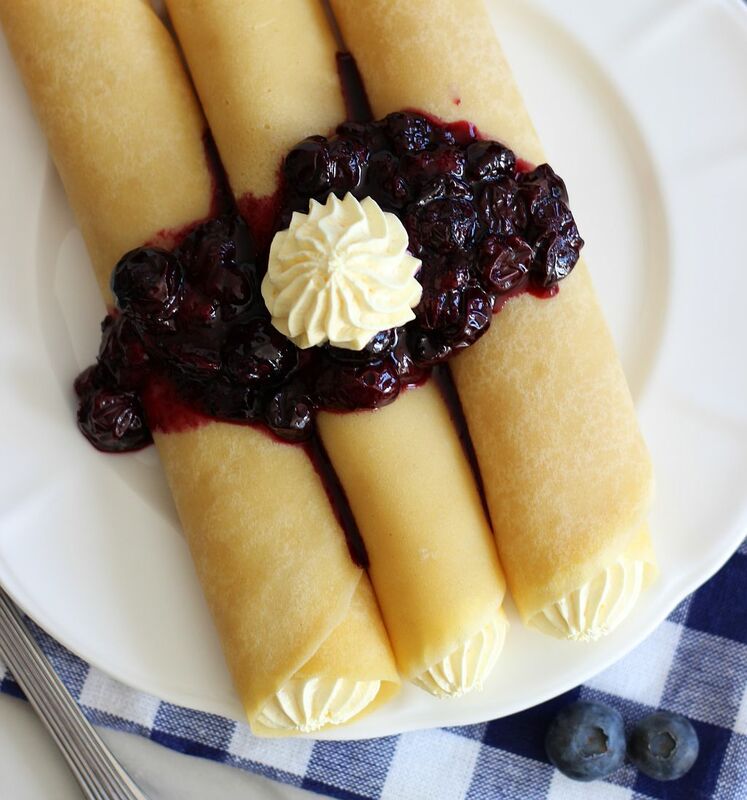 Your crepes look heavenly! 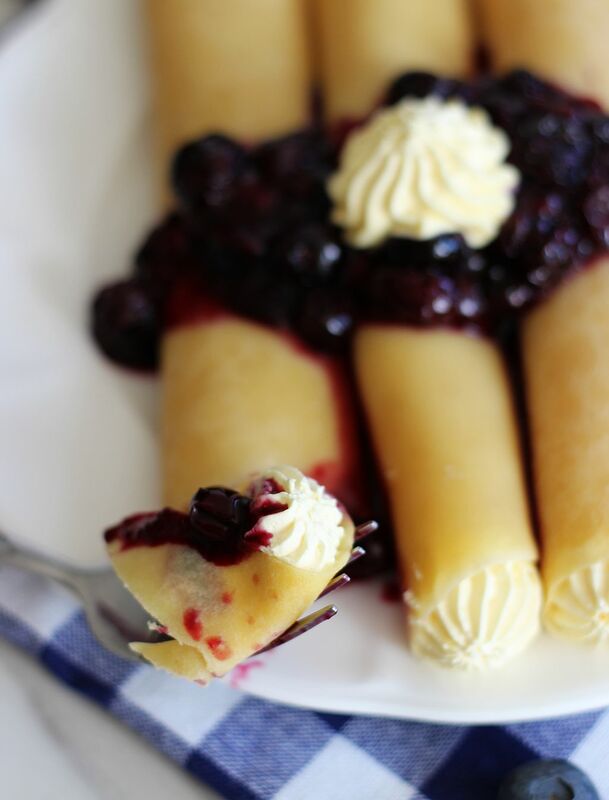 Your crepes look amazing. Love the flavor combination of key lime and blueberry! Can’t wait to try them! Thank you for sharing! Have a great week! These should be in a magazine! Amazing. This caught my eye on Inspiration Spotlight Link up today! Aww, thank you! That is so kind of you to say!!! So glad you like them! This sounds really good. I become obsessed with Key Lime every Spring since we went the Keys a couple years ago. And they are cute! I’ll have to try out this recipe. 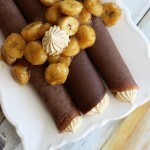 Stopping by from the Weekend Recipe Link Up Party. . . . . . . .and aren’t we all behind right now?!? Between the snow days and sick kids here I can’t seem to figure out whether I’m coming or going. I love crepes! The key lime filling in this one sounds delicious and seems so easy. I’m looking forward to trying your recipe. Thank you for linking it up at This Is How We Roll Thursday. Thank you so much for the party! Hope you had a wonderful weekend! I’m sorry about your crepe cake fail but your key lime crepes look incredible!! I absolutely love key lime! I was so glad to see your recipe at #FoodieFriDIY! Spreading some foodie love around for you. 🙂 Hope you are having a great weekend! WOW! These look fantastic!! I’m thrilled you linked up with us at Snickerdoodle Sunday…hope to see you again this weekend with your latest makes! What size box of pudding? The big or the small? 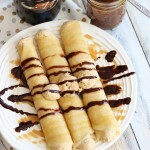 I’m excited to make these for our family’s Easter crepe brunch! Oh how fun!! I hope you like them! Thanks for pointing out that I didn’t specify – I pretty much always use the small boxes, 3.4 oz.! Let me know how they turn out for you!